The revised executive order, temporarily halts entry to the United States for people from six Muslim-majority nations while dropping Iraq from the list. WASHINGTON: The revised executive order, temporarily halting entry to the United States for people from six Muslim-majority nations while dropping Iraq from the list, "does not make US safe", top Indian American lawmakers said. "Make no mistake: this ban does not keep us safe. It puts American lives at risk while isolating the Muslim community at a time when we need to address the threat of homegrown extremism. No matter the changes, this executive action remains immoral and fundamentally un-American," California Senator Kamala Harris said. Harris, who is the first Indian American US Senator was joined by other four Indian Americans in the House of Representatives –- Ami Bera, Raja Krishnamoorthi, Ro Khanna and Pramila Jayapal, the first Indian American woman to be elected to the House. 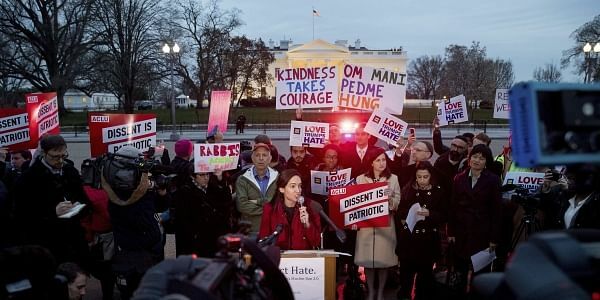 "While I welcome the decision to omit Iraq from the list of banned countries, the President still has an obligation to provide evidence of a national security threat posed by immigrants and refugees from the remaining six countries," Harris said. "Omitting one country from the list does not eliminate the need to provide the American people with meaningful evidence supporting this ban. The White House had more than a month to develop their case, and has failed to provide actual justification based on facts," she added. Jayapal said, in his new executive order, Trump has been forced to recognise that his original travel ban was both "unconstitutional" and "ineptly" executed. "The new order recognises that we must honour the visas of those who already have been given clearance to come to the United States, as well as excludes legal permanent residents and dual citizens affected by the ban," she said. "It also excludes Iraq from the list of the banned countries, another clear sign that such a ban would hurt our coalition efforts for peace in the Middle East. It should not have taken the courts and nationwide protests to stop such an order from taking effect in the first place," she said. The president was "irresponsible" in "throwing" the country into chaos and putting fear in the hearts of millions of families, she added. "Unfortunately, however, the president's Muslim Ban 2.0 is driven by the same xenophobic priorities that wreaked havoc at airports around the nation and led to the shameful detentions of innocent men, women and children," Jayapal said. "It continues to single out Muslim majority countries only, drastically limits and suspends refugee resettlement, and deeply affects our relationships with countries around the world. It continues to do nothing to make our country safer, alienates our allies and gives extremists propaganda for recruitment," she said. Congressman Ami Bera, vice-ranking member on the House Foreign Affairs Committee, said the executive order affecting immigrants and refugees from Yemen, Syria, Somalia, Libya, Sudan, and Iran targets specific groups and alludes to a specific religion does not enhance the national security "in fact this does the opposite". "This is a bad second swing at an executive order that is just as un-American and xenophobic as the first version that was struck down by multiple courts. As Americans, we do not close our doors to those who are fleeing persecution, or target people based on their faith," he said. Congressman Ro Khanna said the Trump administration's repackaging is merely a second attempt to revise his unconstitutional policy. "This is the same ban, driven by the same hazardous discrimination that weakens our ability to fight terror. Revised language won't change what this executive order is: an act that prohibits people from entering the US based on their religion or refugee status. "The public and courts rejected the Trump administration's first attempt at this, and it must do so again," Khanna said.